Smooth, velvety chocolate... ripe, juicy plums...sweet, delicious raisins...have we got you salivating yet? Well, unfortunately for you we're not talking food here but at least we can provide a little eye candy. This palette of chocolate brown, plum, and raisin is a lovely color combination for a modern fall wedding. It's gives a totally different feel then the usual "warm" fall colors like marigold, orange, and red, but still is cozy and comforting, just as fall should be. 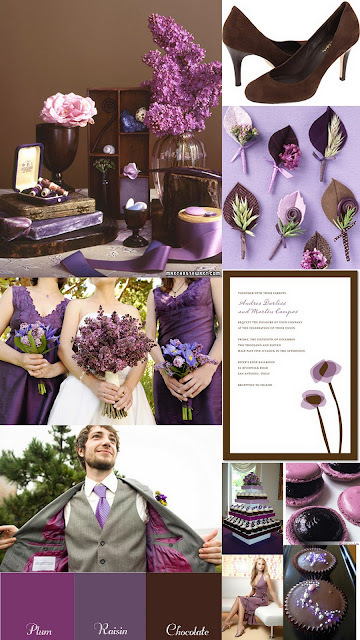 Purple is increasingly popular for weddings, decor, and wardrobes and, when paired up with rich chocolate brown, it's extremely charming and feminine.